This entry was posted in 7. 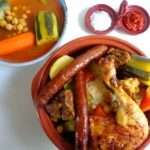 Meat Dishes and tagged couscous, most popular French dishes, North African cuisine, recette, recipe. Bookmark the permalink. Many thanks, Cecilia! Merci beaucoup. awesome recipes. really great blog.